Treat yourself to only the best!! This Luxurious, Newly Renovated Carriage House creates the perfect oasis for any trip whether your visit calls for business or pleasure. The Grand Entrance offers Breathtaking 18 foot ceilings and Large Bay Windows within its Sun-Filled open-styled floor plan. This unique modern 2 bedroom, 1 bath designer styled abode with its very own private entrance, features Queens Size Beds in both Bedrooms (equipped with 40" TV's), a Private Deck, 60" TV(Living Room), Cable, Netflix, Phone, Wi-Fi, along with a Sonos entertainment system to enjoy the sounds of your favorite artists via Spotify or Pandora. .
Linen & towels are provided. If you should need to launder any clothes, there is a washing machine and dryer located within the unit. This Home Away from Home can sleep four people comfortable and up to Six with an Air Mattress that's provided, if necessary. 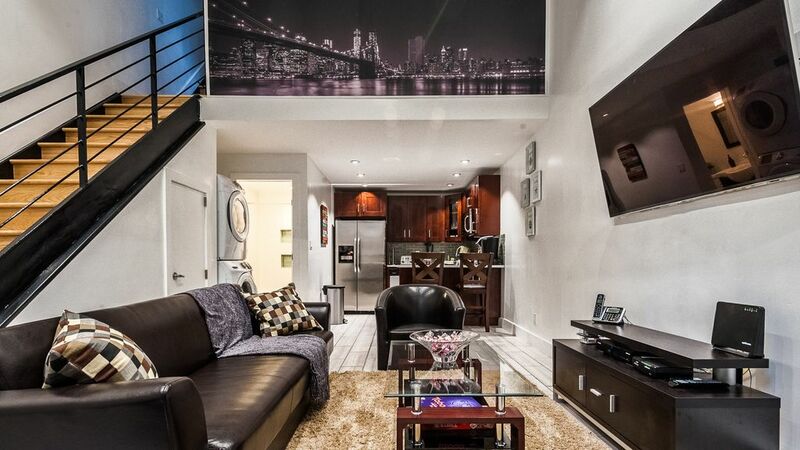 Located in the City of Dreams nestled on a nice, quiet block in Brooklyn you Will not be disappointed. So Come, Enjoy, Relax and Unwind. Only 5 minutes from the house is the J subway line. Gets you to Manhattan in no time at all. 15 minutes to Manhattan, 30 minutes to Central Park. 25 minutes from JFK airport. 25 Minutes from Laguardia Airport, 45 minutes from Newark Airport. For larger groups and additional space, this Carriage House can also be rented along with Unit #1 (VRBO #863266), which sleeps 4 comfortably. Great place for our business trip. Washer dryer extremely helpful. Clean with full kitchen. Harvin was an attentive host and travel guide too. Highly recommend. We enjoyed the city during the day and came back to a fully equipped, private and lovely space to unwind. We even found parking to be a breeze! Harvin made sure we had what we needed and was immediately available by phone or text if we had a question. We will be back to Brooklyn and our first choice will be this VRBO. We enjoyed our stay in the Bed-Stuy neighborhood at Harvin’s carriage house. It was great for our family of four. The two bedrooms and pullout couch were just what we needed. The place was very clean when we arrived and Harvin had left a delicious bottle of red wine for us to enjoy! The kitchen was stocked with essentials, there were linens for all the beds, and plush towels for the bathroom. If we had any questions, Harvin was always quick with a helpful reply. We felt safe in this neighborhood and will definitely recommend this VRBO to others! Thanks for sharing! It brings me such pleasure that your family enjoyed the carriage house and your stay so much. This is what makes a great overall VRBO experience. Hope to see you again soon! Perfect for our Brooklyn experience! We had a wonderful time staying here! There were three adults and two children and we all just thought the property was awesome and welcoming. You will be greeted with a bottle of wine and a very clean house. The only thing we didn’t like was the couch, the cushions don’t stay on very well, So it was hard for us to lounge around together. But honestly, that is just being picky. The best part was Harvin, he is so nice and made sure we had everything we needed and checked in with us during our stay. He is super responsive and super polite and welcoming. We couldn’t have had a better experience. Thank you Harvin!!! Both my girls said one of their favorite parts of our trip was our house. I call that a HUGE win! The bottle of wine was awesome, especially to have a glass of wine after a long day of sightseeing! This apartment is very nicely maintained and furnished. It's incredibly clean and the owner is extremely responsive. I would definitely recommend it. Not recommended for people with mobility issues as there are a lot of stairs and they can be slippery.